The Belgian Shepherd Dog (Groenendael) is the most popular breed of Belgian Shepherd Dog. 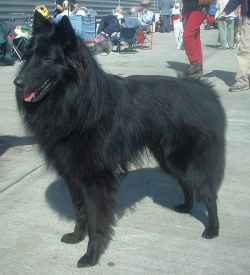 The Groenendael is recognized by all major kennel clubs. In the United States it is recognized under the name Belgian Shepherd Dog. Like all Belgian Shepherds, the Groenendael is a medium-sized, hard-working, square-proportioned breed of dog in the sheepdog family. The Groenendael is recognized by its distinctive black coat.